High technology for the office environment. The Vital range not only offers stylish profiles but also the reassurance that it is an engineered solution that maximises the use of shared components. 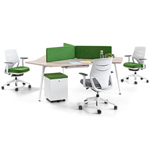 Vital’s modular designs allow you to effortlessly distribute and reconfigure multiple workstations. Vital Pro is a paired down budget version of the Vital system.